It’s fortunate that cats have nine lives because they tend to injure themselves quite frequently. This mostly occurs because of another attribute we ascribe to our feline pets: they are very curious animals. Whilst they mostly explore without experiencing any problems, cats occasionally find themselves in a situation which does them harm. Cats are more likely to hide their pain than dogs, so identifying injuries can often be more difficult. 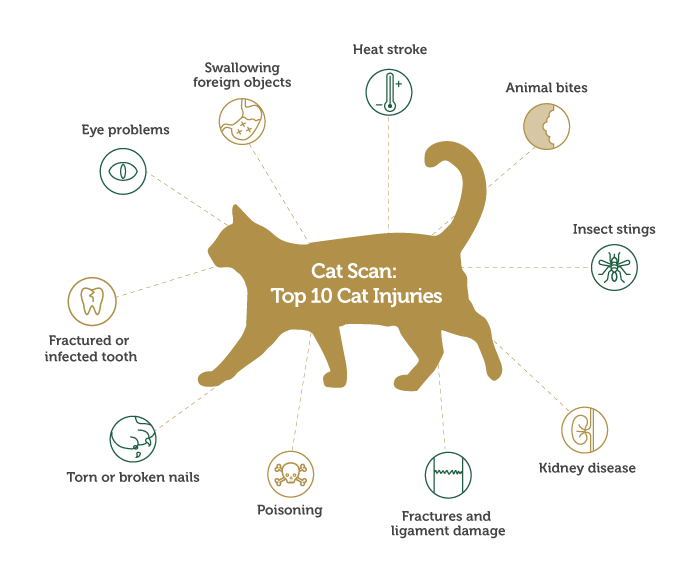 Here are the top 10 most common cat injuries, including some of their more likely causes. Running through branches at speed and fighting with other cats frequently can result in scratches to the eyes. While cats are much better than dogs at knowing to keep their heads back while swinging their claws around, it is still common for cats to suffer a hit now and then. Even milder injuries should still be looked at by a vet, as a small scratch can result in infection. Eye problems are already quite common amongst cats, including conjunctivitis, cataracts and retinal disease. Cats tend to be much more careful about what they put in their mouth than dogs, but playing with toys or eating food with bones can sometimes result in something getting stuck in your cat’s throat. If you suspect something is lodged where it shouldn’t be, go and see your vet as quickly as possible; even if your cat is breathing normally, the foreign object could cause internal damage. Cats must rely on the relatively ineffective method of panting to cool down when they are hot. Consequently, cats sometimes suffer from heat stroke and need help recovering, especially when they have a lot of fur. Overweight and young cats are particularly at risk, so feed your kitten a healthy diet to prevent obesity. British Shorthair, Himalayan, Persian and Scottish Fold breeds are especially at risk of heatstroke. Cats occasionally have run-ins with other animals while exploring, especially dogs and other cats, and fighting often occurs when animals roam into one another’s territory; biting and clawing can result in puncture wounds. A bite from a big dog can be very dangerous, but watch out for puncture wounds from smaller dogs and cats, too. Smaller teeth leave wounds which seal up quickly, trapping bacteria inside, leading to painful abscesses. Cats have long sharp canines which can easily puncture the skin in a fight; for this reason, cat bites can be worse than a dog bite as the bacteria transferred from their teeth goes deeper into the body than a more superficial dog bite. If you suspect your cat may have a wound or abscess, seek veterinary attention to help reduce the chance of an infection developing. Another common hazard from all that rummaging around in plants and bushes comes from stinging insects. Cats are quite sensitive to stings and will show clear signs of physical discomfort (it can be helpful to know how your cat expresses him or herself when they are in pain, such as keeping their body low to the ground and by keeping their muscles tense). Though not truly an injury, kidney disease can occur in cats of any age because of trauma or infection, the disease is especially common in older cats, with the risk increasing after your cat reaches 7 years old. If your cat is drinking more water, urinating more frequently, maybe in unusual places, we strongly recommend going to see your vet. Many vets offer senior health checks that aim to detect any problems early. 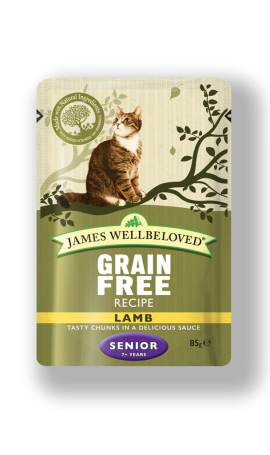 A good quality senior cat diet will be lower in phosphorus and this can be beneficial to kidney health. Whether from a car accident, a fight or jumping from a great height, cats can suffer from bone fractures and breaks, or simply push themselves too far and irritate their ligaments. Major breakages are obvious from the very beginning because your cat will likely be moving awkwardly and uncomfortably with vocalisation common. However, some injuries are not so apparent right away, such as bruising to internal organs or inflammation of the joints which might worsen over time; see your vet if you suspect anything is amiss. Cats sometimes make mistakes when choosing what to eat. This is especially relevant around the house where you might use nice-smelling chemicals or items which could poison your cat when ingested. Keep your cleaning chemicals in a closed, locked, cupboard and check any houseplants are not poisonous to cats. Jumping from great heights or catching a nail can cause a tear or break which can be very painful. Your cat’s paw will most likely bleed a lot, but also look out for him or her licking their paw excessively or limping. Bleeding normally stops after a few minutes, so if it doesn’t, take your cat to the vet for treatment which may include a bandage. There is an incredible 85% chance of cats over 2 years old developing periodontal disease in one form or another. It is caused by a build-up in plaque, so clean your cat’s teeth well and regularly. Unless they are trained to accept tooth brushing, cleaning your cat’s teeth can be a dangerous task. 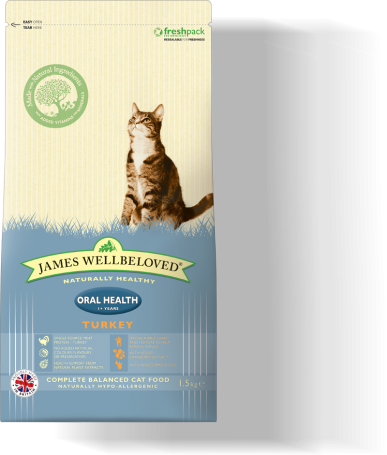 James Wellbeloved has an Oral Health diet formulated to help keep your cat’s teeth clean. Unfortunately, if your cat bites down on hard objects, such as bones in food or an unsuitable toy, they can fracture their teeth, which can also lead to tooth or gum disease. Try to limit this by providing your cat with soft toys and avoid food with visible bones. Cat injuries are a natural consequence of their active and curious lifestyle. Whilst you can help reduce injuries by being careful about what you feed your pet and what objects you have around the house, you will never avoid them entirely. However, by understanding the most common injuries and their causes, as well as recognising some of the key signs of injury you will be better able to spot when your cat is hurting and in need of some care and attention. Some of these signs are an abnormal walk or posture, excessive licking, tail flicking or vocalisation, withdrawn or less active behaviour, or a decrease in eating, drinking and grooming.